In my last blog, I flirted with the topic of choices and some of the dilemmas created by having such a situation arise. Well, I now have one of an even more serious nature than the life or death occurrences that I’ve had to face recently (I’ve not yet heard from the neurosurgeon in Colorado, but during our brief visit last week he indicated that his first cursory glance at all the xrays, MRI’s, Myelograms, and my picture ID, didn’t show anything needing spinal surgery! He’s to have a closer look on the computer and call me this week). So here’s my problem: The Super Bowl. Good fortune has placed my two favorite teams against one another, and the outcome might strain some family loyalties. I’ll explain. During my collegiate years at The University of Kansas in Lawrence, I spent a lot of time in the old gym, shooting baskets and playing pickup games. Often, those activities included some of the school’s football players (yes, during those years they actually had a football team, even one which was in the Orange Bowl!). I sometimes played one-on-one with John Hadl, later to be the quarterback for the San Diego Chargers for many years. Some of our intramural games were against one team composed of subsequent pros; in one such game my forehead was contacted by the forearm of Curtis McClinton, running back for the Chiefs; I was stuck trying to guard Fred Hageman, later the center for the Redskins and about twice my size. Bert Coan, halfback for the Chiefs, and Doyle Schick, a Canadian League fullback, also contributed their fair share of bruises. About the time we were graduating, the American Football League came into being, and I focused my loyalties on the Kansas City Chiefs, and Lennie Dawson, Otis Taylor, Curly Culp and their colleagues. In those early days, games were played in the Triple AAA Kansas City Blues baseball stadium, and tickets were cheap. However, my being frugal, I would buy the cheapest end zone ticket for $2 (yes, $2!) and as soon as I entered go to the concession stand. There, I would buy two cups of coffee and head to the stairs around the 50 yd. line. As I ascended, the ushers never questioned me, as I “obviously” was returning to my seat with coffee for “my friend” and me. I would find an empty seat and enjoy the game. And I was alone, except for two cups of coffee. As I left KC, my focus dwindled a bit on football through the years I moved about the country and the world. Ultimately, I met my wife and we moved to Colorado shortly after our wedding so that I could work on a graduate degree. During that time, we had little money so our entertainment was working jigsaw puzzles bought at the local Skaggs drug store, or watching rabbit ears TV. And with little latitude to watch anything else, began to follow the Broncos. We became stalwart fans, and I didn’t suffer too many pangs of guilt when the Broncos played my formerly beloved Chiefs. And we even experienced near-grief when the Broncos lost two Super Bowl appearances in the late 70’s. By this time, we had produced two sons and they were rapidly indoctrinated along the path of righteousness relative to whom to support in the pigskin world, even without waterboarding. My older son and I even dropped in at a pre-season training camp in Greeley, where he got lots of autographs. Unknowingly, I was wearing the same blue shorts and white shirt that the coaches wore, and several folks approached me for autographs. I didn’t give my right name. Well, the boys grew up and set about finding their own places in the world. And as they did so, this is where the roots of my current crisis were formed. You see, our older son is an attorney in Charlotte, home of the Panthers, and has one of their more prominent players among his clients. 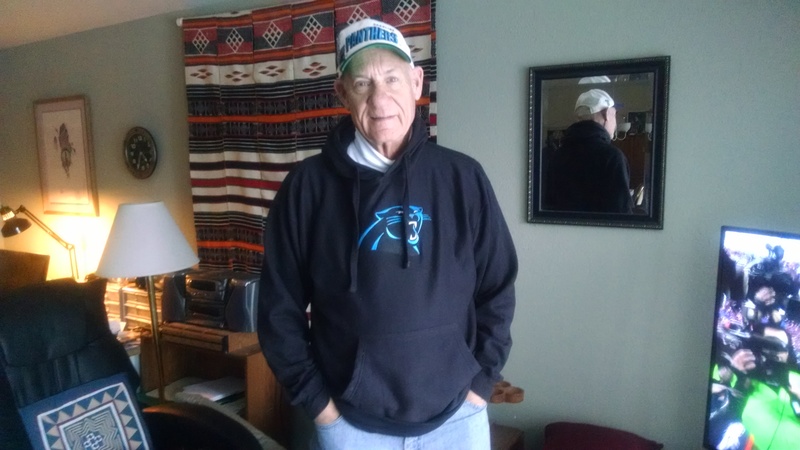 So naturally, this past Christmas I was the recipient of a new Panthers’ hoodie to wear throughout the playoffs. My other son was pursuing a career as a construction superintendent for large projects, centered in the Dallas area but also in a few other locations such as the new International terminal at LAX, or a 34 story hotel/condo in Ft. Worth. He met his wife in Dallas, spying her wearing a Bronco shirt in an overwhelmingly Cowboy environment. He quickly made his moves with his own Denver outfit, and the two were happily married a couple of years later. The wedding itself was a Bronco celebration; her garter was orange and blue and after removal, stretched around a football to throw to the groomsmen. Each table had a different player’s name, the head table being the Elway table. We sat at the Gradishar table, and in fact Gradishar’s daughter was the wedding photographer! But the ultimate emphasis on this theme came from our daughter-in-law’s mom——she was formerly a Denver Broncos Cheerleader! 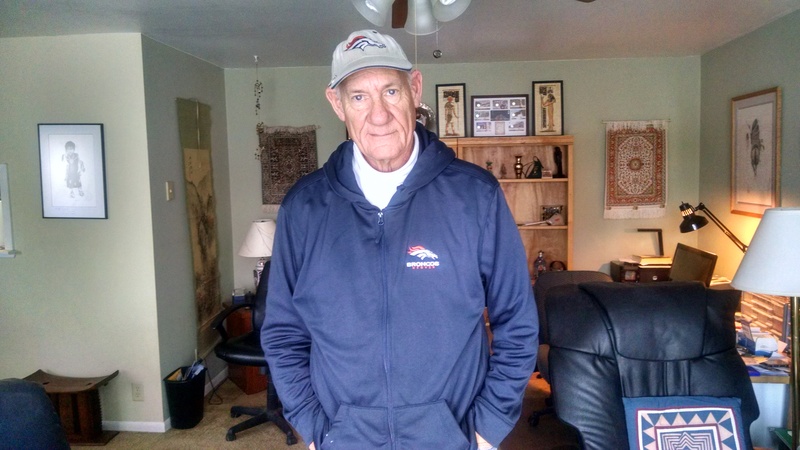 And so, at the same time I was receiving that Panther hoodie, I gained another Bronco hoodie to add to my closet, this one from my other son. I wore these on game days throughout the playoffs and had to quickly change between games on Championship Sunday. If one is superstitious, then it could be assumed that it is necessary to don one of these garments in order to assure a victory for the chosen team. SO WHAT SHOULD I DO SUNDAY? PLEASE HELP!